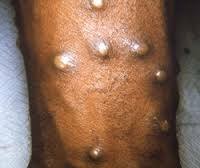 The symptoms of monkeypox are similar to but milder than the symptoms of smallpox. Monkeypox begins with fever, headache, muscle aches, and exhaustion. The main difference between symptoms of smallpox and monkeypox is that monkeypox causes lymph nodes to swell (lymphadenopathy) while smallpox does not. The incubation period for monkeypox is usually 7−14 days but can range from 5−21 days. Monkeypox can be tentatively diagnosed if the characteristic skin lesions are present and there is a history of exposure. 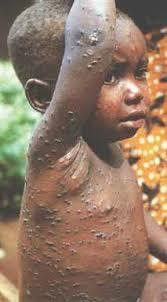 Treatment of monkeypox is mainly supportive. The antiretroviral drug cidofovir has been promising in vitro and in animal studies, but its efficacy against monkeypox in humans is unknown. The majority of cases have been reported in rural regions of the Congo Basin and western Africa, particularly in the Democratic Republic of Congo. Monkeypox cases were confirmed in the Midwest of the United States of America, marking the first reported occurrence of the disease outside of the African continent.